Companies expect to decrease their cash holdings in the coming quarter for the third consecutive quarter, according to the AFP Corporate Cash Indicators ® (AFP CCI). However though willing, companies are exhibiting some signs of caution and are taking a wait-and-see approach before committing to investing cash. AFP began collecting quarterly data in January 2011 and has now collected 18 data sets. See www.afponline.org/CCI for answers to frequently asked questions. The next set is slated to be published July 27, 2015. This is the first time the CCI, which debuted in January 2011, found that firms anticipate decreasing cash holdings for three straight fiscal quarters. Published each fiscal quarter by the Association for Financial Professionals (AFP), the AFP CCI measures changes in corporate cash holdings quarter-to-quarter and year-over-year, as well as the expected change in short-term investment and cash accumulation in the coming quarter. The CCI is underwritten by Capital One Bank. 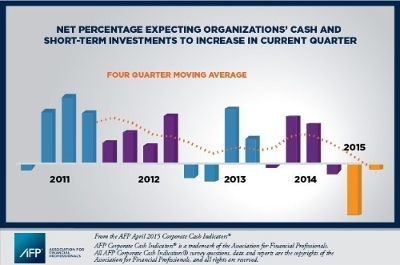 Businesses’ willingness to deploy cash decreased in Q2 15 compared to Q1 15. This is likely due to the rising value of the U.S. dollar, a particularly harsh winter across America, and a labor dispute that slowed traffic at West Coast ports. The latest CCI found that for the second quarter in a row, organizations’ actual behavior has not aligned with their expectations entering the quarter. It is likely that even modest improvements in economic or regulatory conditions could open corporate wallets for hiring, capital investment and acquisitions. Each quarter, AFP asks select members representing a broad cross section of U.S. businesses the same questions: whether their company’s short-term holdings increased or decreased in the past year and past quarter; whether investment selections for those holdings changed; and whether they expect cash holdings to increase or decrease in the coming quarter. AFP member companies have agreed to participate in this ongoing study on a long-term basis.